Toronto doesn’t have the world’s best weather, but the summer months are great while they last. Thousands of families enjoy spending evenings and weekends outside with relatives, neighbors, and friends. Many have discovered a way to make the experience even better: investing in an outdoor kitchen. Outdoor kitchens might sound like a luxury item but in fact they’re simpler, more affordable, and more functional than you might realize. If you think an outdoor kitchen might be part of the recipe for making your home a perfect place for outdoor relaxation, installing the right outdoor cabinets is an important part of the process. Why Get an Outdoor Kitchen? We all enjoy connecting with friends and loved ones around a home-cooked (or grilled) meal and some cold beverages. An outdoor kitchen allows you to do exactly that, while enjoying the entire experience outside in the fresh air and sun. You can cook and eat the entire meal outside, bypassing the inconvenience of carrying dishes back and forth. You probably already have a backyard grill. Upgrading to an outdoor kitchen takes that as the starting point, but expands your backyard to include countertops, a refrigerator, a portable stove, and outdoor cabinets. An outdoor kitchen is a sizeable investment. You want to take care to get everything right. For starters, everything needs to be waterproof. That means the cabinets should be as water resistant as possible. Many types of wood commonly used in indoor kitchen cabinets simply won’t do. Teak – This exotic hardwood looks great, can easily be treated with a waterproof finish, and is rot resistant so it lasts longer than other wood options. Teak cabinets tend to wear a bit due to exposure to sun, so they might need to be refinished from time to time. Also, they need to be custom built by a cabinetmaker. Cypress – Another exotic hardwood, cypress is a preferred option for many high-income homeowners. It’s strong, easily waterproofed, looks gorgeous, and ages gracefully. It costs more than other options, however. Stainless Steel – These are the favorite outdoor option for many Toronto Stainless steel is durable, waterproof, and relatively affordable. However, take care to choose high quality steel. Stiffness is a sign of durability. You should also make sure the cabinet corners are welded, not riveted. They’ll be more durable. Polymer – These synthetic cabinets, often referred to as “marine grade” in their waterproof form, are a strong addition to any outdoor kitchen. They’re truly watertight so can be hosed down regularly without wear-and-tear. They also look great and are stain resistant. Marine-grade polymer tends to cost a bit more than stainless steel, but many savvy homeowners swear by these cabinets, and for good reason. Outdoor cabinets are also great because, if you aren’t ready to go all-in on an outdoor kitchen, they serve a useful storage function in their own right. If you’re ready to take the plunge and upgrade your home with outdoor kitchen cabinets, it’s important to choose the right company to help with the planning and handle the install. M.E. Contracting is a leading option in Toronto and the surrounding area. We have an excellent group of designers and well as highly-skilled, professional installation crews, projects big or small are always up to snuff. Plus we have the only showroom in Ontario fully dedicated to outdoor landscaping and construction. 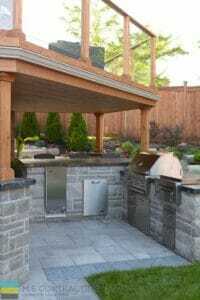 Call us today at 416-238-6700 and get started on your outdoor kitchen!